Mr Broke Hoedown tells me that Mickey’s flying the battle flag of the old Japanese empire. Anybody out there able to translate the text? bwahaha . . . I almost just fell out of my chair laughing! I’ll send it to my friend in Japan so see if she knows. My Japanese friend here at work says it basically says “Mickey’s Army” or “Army of Mickeys” and that it seems to be from a really old comic book. 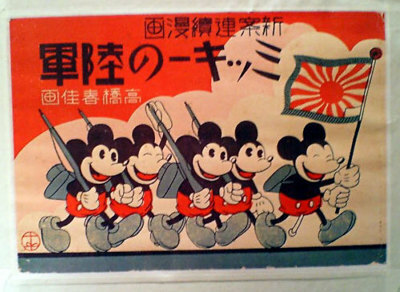 My friend from Japan confirms that it says “Mickey’s army” and that it is from a comic strip. The flag by the way is called the Optimist. Mickey is carrying a regimental battle flag, hence the white area at the bottom of the flag. Not used since 1945.